The score sends a strong message about the tone of Wentworth Prison right from the beginning. The episode’s title card is the first to contain no quote of “The Skye Boat Song” at all. Instead, a deep string note provides a foreboding sense of doom over the creepy imagery of torch-lit torture devices. I strove to provide a sense of emptiness, a bleak gap where we were expecting melody, to let us know the episode is going to dark places. 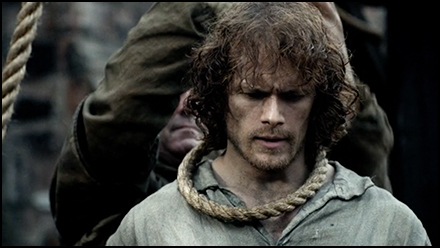 Wentworth Prison deals with Jamie being held captive by Randall, while Claire attempts, ultimately unsuccessfully, to rescue him. The score following Claire is familiar: Scottish instrumentation provides an exciting backbone offering the hope that she will accomplish her goal. The real musical challenge arose with the Jamie and Randall scenes. My scores for Wentworth Prison and To Ransom a Man’s Soul resulted from some of the most depressing writing sessions of my recent career. I am a bit of a method actor when it comes to writing music. I can’t fake the emotion. I have to feel it. I have to take myself to the same emotional place as the characters onscreen and use that emotion to fuel my musical inspirations. There are scenes of gruesome physical and psychological torture in these episodes and I had to live within them for days on end to get the score done. I read a review of Wentworth that remarked that the episode was so intense the reviewer would likely never watch it more than once. Well, imagine how I feel! Tallied up, I probably watched the whole episode a hundred times! 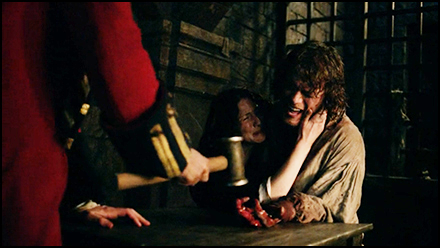 The scene where Randall nails Jamie’s hand was the most devastating. Every time Randall drove the nail in deeper, I was experimenting with new string clusters, synth textures, and percussive hits. I strove to find the perfect combination of rhythm and sonority to provide the absolute maximum discomfort for the audience. The process of doing that forced me to live the scene over and over. I worked on that short sequence for at least forty-five minutes before I had to stop and take a break. My hand was physically starting to hurt, from the emotional trauma of watching the footage! In addition to hitting all the exact moments to maximize the dramatic tension, I also struggled with the timbre, or sound, of the score. I was tempted to introduce new sounds, but I also knew that I would need to follow up this score with an even darker one in the finale. So, I set parameters for myself. For Wentworth Prison, I forced myself to use only the instruments I had introduced already, requiring that I find ways to efficiently create new, horrific sounds out of them. If I could pull that off, I would allow myself to introduce new sounds in the next episode to get even darker. I experimented with small string ensemble clusters, creepy fiddle harmonics and digitally drop-tuned bagpipe drones. The result is a terrifying bed of sounds that are, nevertheless, rooted in the Outlander score we are familiar with. After wallowing in despair for nearly an hour, Wentworth Prison ends on a surprisingly upbeat note, when Murtaugh suggests he has a plan to rescue Jamie, somehow involving nineteen Highland cattle. This scene crescendos into one of the most rousing End Credits cues we’ve had in a while. I knew I wanted something folky and fast to close out the episode, but I struggled to find a traditional song that had relevant lyrics. Ultimately, I decided to write my own folk song, an approach I’ve used several times throughout this series. My end credits tune is pretty catchy, and is performed by fiddle, uilleann bagpipes and accordion. To Ransom a Man’s Soul is one of the most riveting and emotionally charged hours of television I have ever had the privilege of scoring. I saved something special for this episode’s title card: “The Skye Boat Song” melody played by an ensemble of Great Highland bagpipes. With this main title sequence, I surprised myself by succeeding in my goal to create sixteen wholly unique endings to “The Skye Boat Song.” Every single episode featured its own version of the title card. Will I be able to keep this up as the series progresses? Who knows? If we get to Season 8, maybe I’ll run out of instruments and resort to slide whistle or triangle solo! I was fascinated by the episode’s structure. A normal television show would have used the entire script to get Jamie out of prison. Instead, Jamie is successfully rescued about ten minutes into the show! I scored this rousing escape sequence with an aggressive rendition of “Sleepy Maggie,” played on Great Highland bagpipes and Scottish percussion, easily my favorite action cue of the series to date. 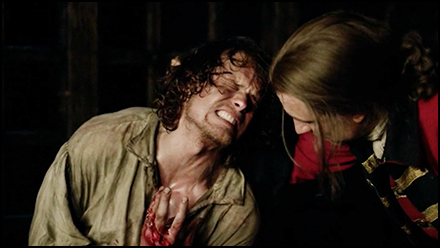 With Jamie’s body rescued, we spend the rest of the episode dealing with the real drama: saving his soul. We also learn more about the events of his torture in several extremely traumatic flashback sequences. The flashbacks presented a new challenge. 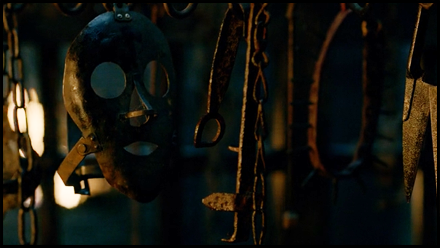 In the previous episode, the torture scenes took place in the present. There was a physical immediacy to the tension that needed acknowledgement in the music. Here, the torture scenes took place in flashback. We already know Jamie is going to get out. The tension is not about what may or may not happen physically. The tension results from the audience being forced to watch the psychological breakdown take place. I wanted it to feel like a nightmare we can’t wake up from. To accomplish this, I introduced new sounds to the score for the first time since the premiere. While airy synth textures have always been a subtle component in my writing for Outlander, here I brought synthesized sounds to the forefront and pushed them into all frequencies. Most notably, the droning synth bass stands apart from anything we’ve heard before on Outlander. The texture is round, hollow and modern. Scraping horrific sound design beds and dissonant reverberant textures create a ghostly backdrop to Randall’s calculated moves. Perhaps most jarring of all, is the lack of acoustic instruments. With a few rare exceptions, I used pure synth textures to score every moment of the flashbacks, saving the familiar orchestral and acoustic instruments for the present day story line. This served to distance us from the events on screen. My hope is that this approach makes us feel for Jamie even more than if the music had been emotional. 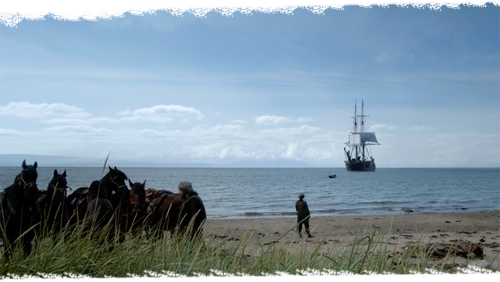 The coldness in the score reminds us that nothing can be done to prevent Jamie from breaking. We know the moment approaches, and we just have to watch. It was a different musical way of approaching musical tension for this show, and I hope it worked effectively. Because the flashback scenes in To Ransom a Man’s Soul were scored in a colder language, I scored everything emotional in the present day storyline warmer. This episode featured Outlander’s largest orchestra to date, which helped provide a sweeping, cinematic sound. 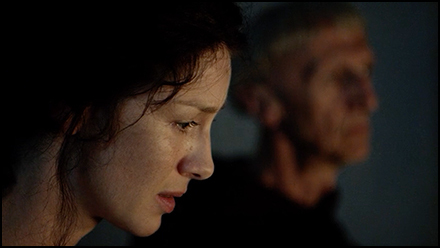 Some of my favorite passages in the episode include the more subtle moments: a distant fiddle solo weeps against a thin bagpipe drone as Claire sutures Jamie’s broken hand, orchestral strings swirl as she tells her story to the priest. Both of these moments make subtle reference to cues in the first episode, homages I hope help tie the sixteen-episode arc together. At the end of the episode, Claire finally gets through Jamie’s defenses and he confesses the truth, that Randall broke him. I scored this entire conversation with fragments of the Claire and Jamie Theme. 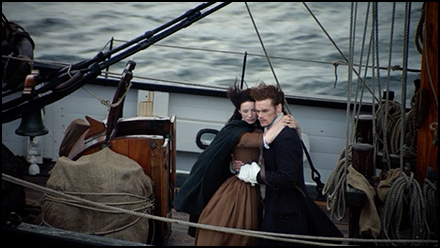 The cue culminates as Claire finally embraces Jamie. Here, the solo penny whistle that represents the most pure version of their theme, states it once more, floating above a foundation of lush orchestral strings. This is the final time we will hear the Claire and Jamie Theme for the season, so I wanted to make sure it landed on a pivotal, emotional moment. With the major conflict of Jamie’s soul resolved, the last two scenes give us a chance to say goodbye to the characters we’ve come to love so much. Emotional strings begin the sequence on the beach. As Rupert and Angus get their hilarious last moment, playful fiddle, bouncing bodhrán and a reeling small string ensemble begin to pick up the pace. 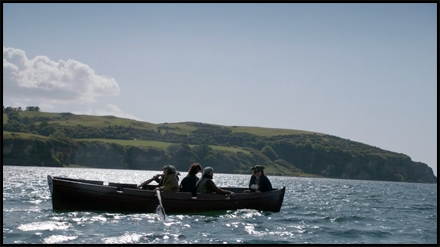 These instruments crescendo as Willie takes one last look back at Jamie and Claire rowing out to their ship. Here, the score bursts into a fully orchestral, lyrical quotation of “The Skye Boat Song,” by far the fullest version ever featured outside of the main title sequence. This moment was just too perfect. For sixteen episodes, I’ve featured a folk song that lyrically references sailing over the sea. 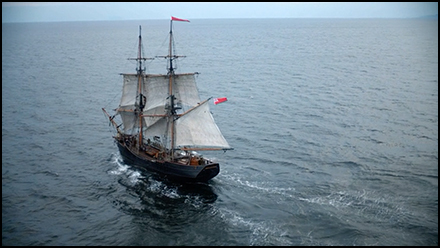 And in the finale, I had a glorious sequence of dialog-less shots of our characters setting out to sail across the sea. I admit, I did not know when I first produced the Main Title song that the last episode would provide such an opportunity! My hope is that hearing “The Skye Boat Song” here would trigger a deep, knee-jerk emotional reaction for fans. Fortunately, this would not be the final time we hear this particular folk song this season. 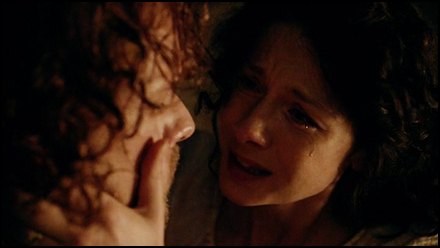 In the episode’s final scene, Claire tells Jamie she’s pregnant. Off their embrace, we pull back to their ship sailing across the gorgeous waters. For this moment, the end of the season, I had several themes at my disposal that would have been appropriate. I considered quoting “The Skye Boat Song” again, but it was less effective here than it was in the earlier sequence where I had already used it. I considered the Claire and Jamie Theme, but that also felt inappropriate, because it worked so effectively when they reconciled three scenes earlier, and I felt that should be the last time we hear it. Then, I tried using a variation of the Stones Theme. The Stones Theme was an interesting choice because it has come to represent several layers of the series. It represents the mystical and unknown, but it also represents Claire’s journey. And clearly, Claire is embarking on a huge, new journey here. The theme was featured prominently in the first episode, the mid-season finale, and early in the second half of the season, so it felt right structurally to bring it back for the big finish. Above all, this particular theme gave these closing shots the necessary scope and grandeur. The instant I experimented with this theme for the end, I knew I had it. As Raya’s last note fades into reverb, my score for the first season of Outlander concludes. I am so grateful for the opportunity to write music on this series, and thrilled that Claire and Jamie’s tale will continue into Season 2. I am also eternally grateful to all the Outlander fans who openly embraced my work, and have followed along my journey. Knowing that you all are listening to every note, with keen ears, helps inspire my best work. I will continue to blog between seasons, and there might also be some exciting news in the near future, so stay tuned. Thanks for reading, watching and listening!